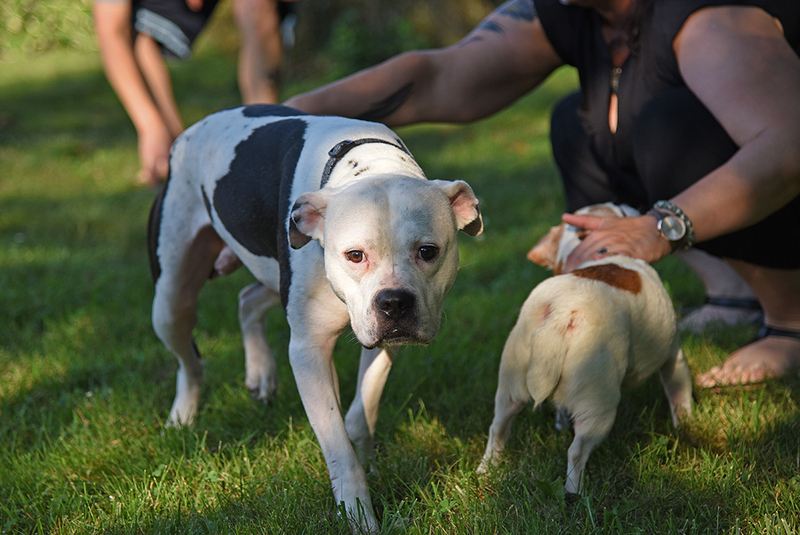 For many dogs, the transition from nervous to confident takes time, and Holstein, a three-year-old pit bull rescued from a North Carolina dogfighting ring is no exception. “He's an incredible boy whose experience speaks volumes about the resilience of these dogs,” says Becky T., who, along with her husband, Kenny, met Holstein at Sammy’s Hope Animal Welfare & Adoption Center, an organization in New Jersey that agreed to place him after he graduated from the ASPCA’s Behavior Rehabilitation Center (BRC) program. Kristen Collins, Senior Director of Anti-Cruelty Behavior Rehabilitation for the ASPCA, reiterates how shy and submissive Holstein was when he first arrived at the BRC in late January 2017. 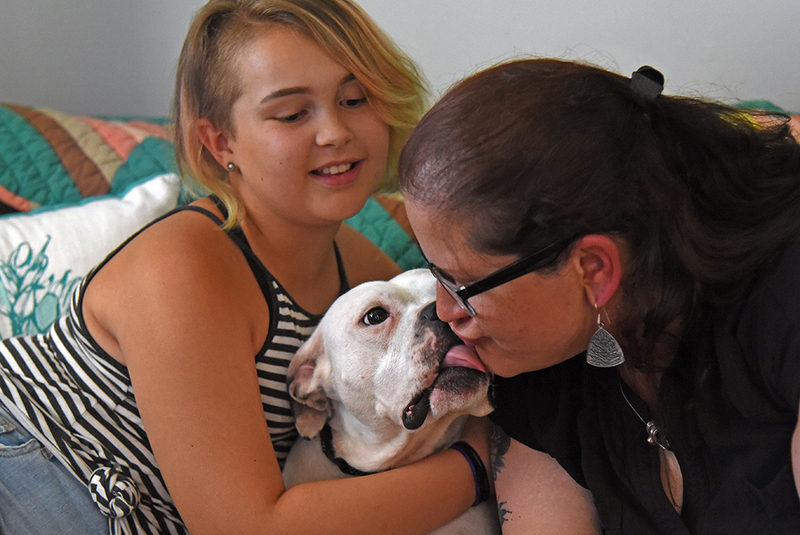 “One thing that was key to his recovery was the lure of social interaction with people,” explains Kristen, who adds that getting fearful dogs to learn to like people is one of the rehab center’s biggest challenges. Kristen and her team would “plant” Holstein’s “best buddies” on walks so he could see and approach his favorite people on his terms. Holstein, named for his black and white coloring that resembles a Holstein cow, graduated from the BRC on March 29, after nearly 10 weeks of hard work, determination and most of all, emotional healing. “There was something about him, those big chocolatey eyes,” says Becky. She and Kenny volunteered at Sammy’s Hope on different days and got to know Holstein “incrementally,” according to Becky. They also watched a video that showed the tremendous amount of progress Holstein made while at the rehab center. 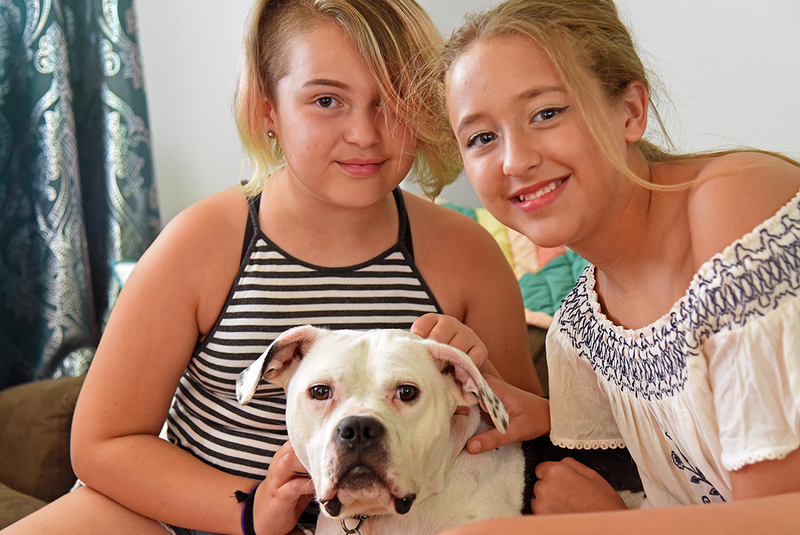 Then, with their daughters Marley and Alex, the family hosted a sleepover for Holstein at their house one night, and then again on Mother’s Day weekend. Once he’d spent some time in their home, it didn’t take long for the family to realize that’s where Holstein was truly meant to be. They went from fostering to adopting in just a matter of hours. 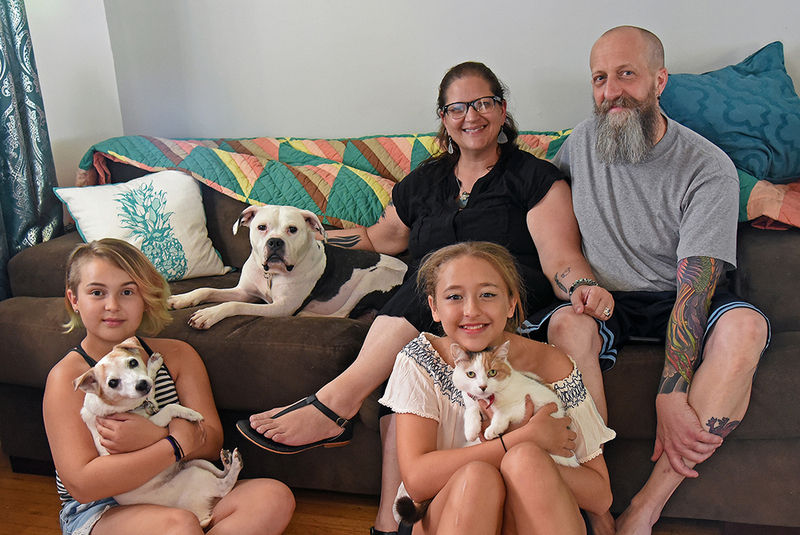 Their family includes Lucy, a 16-year-old Jack Russell terrier and four rescued cats: Ghost, Gypsy, Skyler and Bubba. “There’s always room for one more,” says Becky. Holstein and Lucy also walk together and play next to each other—something he took comfort in during his rehabilitation, according to Kristen. “He enjoyed walking with ‘helper’ dogs—dogs that were confident and socialized and helped him come out of his shell.” Kristen’s team also worked extensively with leash application—a fear that was “debilitating,” but not surprising given Holstein’s background. Today, Holstein often wags his tail, a sign that the once extremely fearful dog’s morale is constantly on the rise. 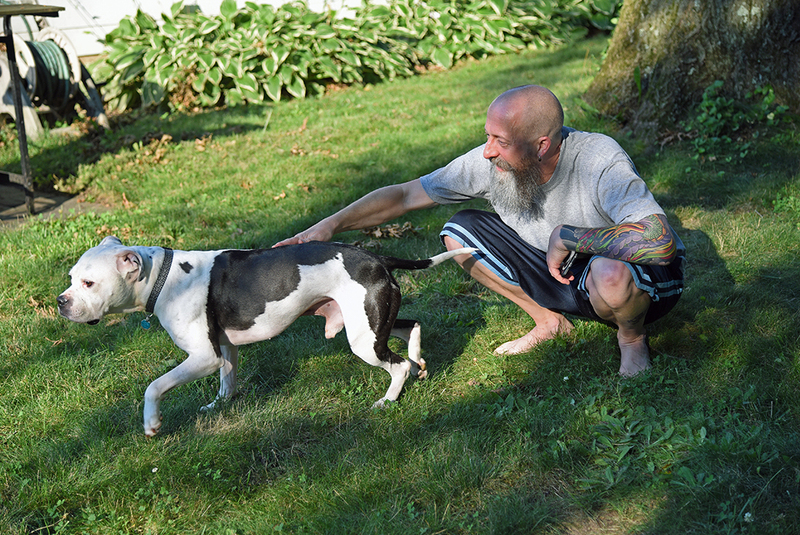 While he once resisted going outdoors during daylight, Holstein now enjoys romping in the family’s backyard. 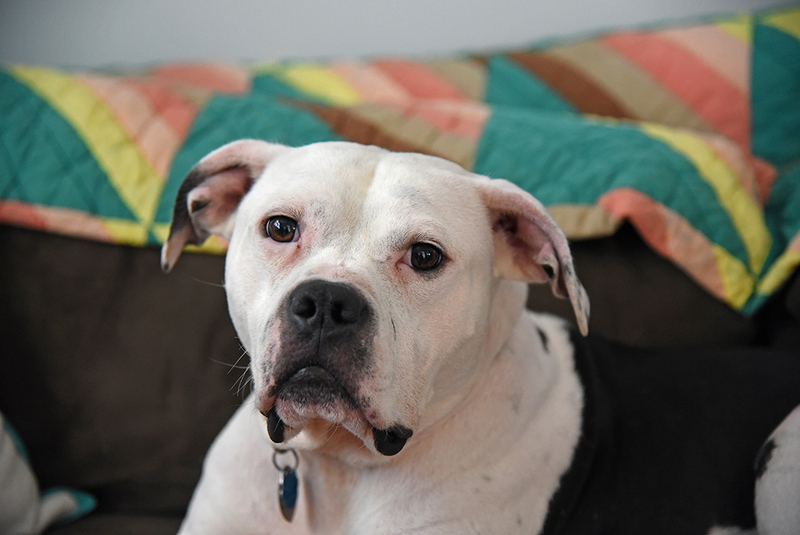 He has an affinity for hot dogs and string cheese, and his bed “is his absolute favorite thing in the whole world,” according to Becky. 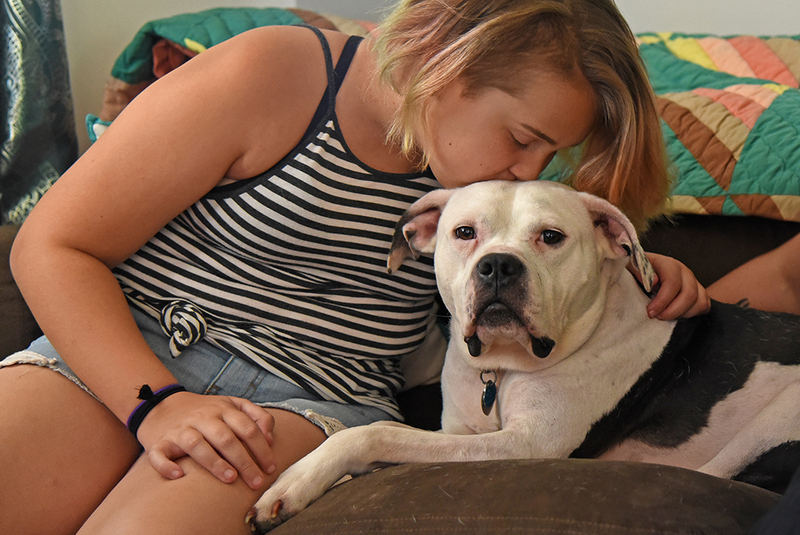 See the video of Holstein’s story and share his inspiring “Happy Tail” with your family and friends!